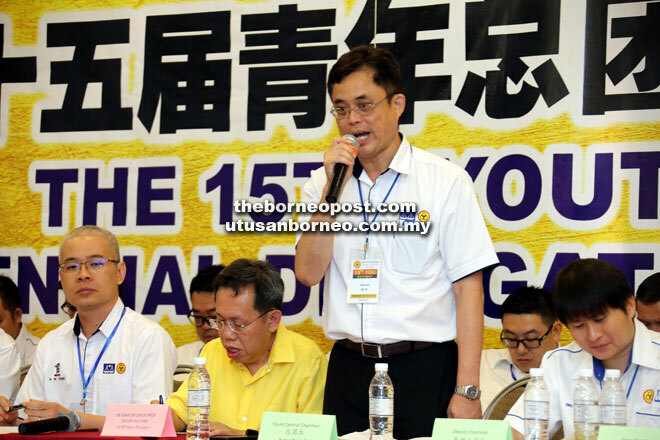 KUCHING: Sarawak United People’s Party (SUPP) outgoing Youth chief Tan Kai has called upon youth leaders and members to serve the community without fear or favour. Tan, who is also political secretary to the chief minister, said they must render assistance to the people in all fairness so as to help the party win elections. “We must assist the people without fear or favour. Let our yellow shirts be seen everywhere,” he said at the 15th SUPP Youth Central triennial delegates conference (TDC) at a boutique hotel here yesterday. A total of 127 Youth delegates and 28 observers attended the opening ceremony officiated by party president Datuk Dr Sim Kui Hian, who is also Local Government and Housing Minister. Tan stressed that unity must be placed above all as far as elections were concerned. He said SUPP Youth Central had to give its unwavering support to the party’s central leadership while collaborating with youth wings of other Barisan Nasional (BN) component parties. “Our emphasis is on parliamentary election. We must work closely with other BN component parties to fight against our political enemies,” he added. He said BN Sarawak had to win at least 29 out of the total 31 parliamentary constituencies in the 14th general election (GE14). “State BN must deliver at least 29 seats or even all 31 seats in GE14,” he said. Sarawak has 31 parliamentary constituencies, six of which were won by Democratic Action Party (Bandar Kuching, Stampin, Sarikei, Sibu and Lanang) and Parti Keadilan Rakyat (Miri) in the 2013 general election. All the lost parliamentary seats belonged to SUPP, the oldest political party in Sarawak that currently holds only one parliamentary constituency – Serian.